All three broadcast network evening newscasts led Friday night by celebrating Al Gore's receipt of the Nobel Peace Prize, portraying it as "sweet vindication" for him while presuming his global warming views are beyond dispute and speculating about the "tantalizing prospect" of a presidential run. ABC anchor Charles Gibson teased: "Tonight, the man who almost won the White House did win the most-coveted award on the planet. So might Al Gore go back to politics?" Reporter David Wright trumpeted Gore's efforts "to call the world's attention to a problem that many would have preferred to ignore," but Wright fretted that not all are aboard the Gore adulation bandwagon: "Even the Nobel Prize is not going to be enough to silence the naysayers, some of whom still believe that man is not responsible for global warming..." CBS's Katie Couric wondered: "Will the former Vice President now go after the prize he lost, the biggest prize in American politics?" NBC anchor Brian Williams empathized with how "he never was awarded what he tried so hard to get and wanted so badly -- the American presidency -- but today former Vice President Al Gore was awarded the Nobel Peace Prize." Anne Thompson enthused that a presidential bid by Gore is "a tantalizing prospect," though "few expect" it to happen. Saturday's Good Morning America kept up the applause for Al Gore's Nobel Peace Prize award, featuring a completely one-sided report from correspondent Bill Blakemore -- who said that scientists were "joyous" over the award to Gore because "scientists have been far more worried than anyone about global warming, finding it's far more dangerous, coming much quicker, than they expected" -- followed by an equally slanted interview with Robert F. Kennedy, Jr., who lectured an admiring Bill Weir that the media have failed to suppress any disagreement with his liberal views "because of a massive propaganda campaign by the Exxon corporation." Winning the Nobel Peace Prize was a "wonderful thing" Al Gore deserved for doing "a great thing," veteran Washington journalist Margaret Carlson declared on Bloomberg Television's Political Capital show, as she contended "he rose above a great injustice" in what occurred in Florida's 2000 election count. Appearing with Bob Novak on the show, hosted by Al Hunt, which airs several times each weekend, Carlson told Novak: "You'd still be holding your breath and kicking your feet if what had happened to Al Gore in Florida had happened to you. He rose above, he rose above a great injustice. And by the way, you know, late in life you can find your gifts, which is Al Gore found what he should be doing and it is a great thing that he's done." When Novak asserted Gore merely "became a demagogue on the global warming issue," Carlson, the former Deputy Washington Bureau Chief for Time magazine who now posts columns on the Bloomberg News Web site, championed Gore's cause as she hailed how "he became a prophet on an issue that is crucially important to the world." Good Morning America anchors and reporters effusively lauded Al Gore on Friday after he won the Nobel Peace Prize for his work on global warming. Diane Sawyer opened the program by breathlessly declaring, "Former Vice President Al Gore wins the Nobel Peace Prize for helping awaken the world to global warming. Now is it time to run for president again?" In her introduction to a piece on the subject, Sawyer gushed that the ex-VP is receiving the award for "for educating the world." Reporter Kate Snow was no less laudatory: "For Al Gore, winning the Nobel Peace Prize is a personal milestone, vindication of a sort." The ABC contributor also claimed that the victory is "a new entry for the history books." To be fair, Snow did inform her viewers that the American politician beat out some very worthy individuals, such as a 97-year-old woman who saved Jewish children from the Holocaust. However, the GMA correspondent never questioned whether there was a political element to Gore receiving the Peace Prize or about the film's factual inaccuracies. She simply labeled the win not just a personal victory for the former vice president, but also "a symbolic victory for his cause." On Friday's Early Show on CBS news of Al Gore's winning of the Nobel Peace Prize brought euphoria to hosts Hannah Storm and Harry Smith, as well as talk of a potential presidential run for the former Vice President. The show began with lengthy congratulatory fawning over Gore, as Smith exclaimed: "And the folks around the Al Gore household are probably running around in their socks and jumping up and down because Al Gore has won the Nobel Peace Prize." Not to be outdone, that was followed closely by Storm's assessment that "certainly, no matter what your politics, everybody likes a comeback story, and this is a comeback story. Wow. Al Gore now in the history books." In order to illustrate this "comeback," Smith proudly observed: "You know, think about this. Seven years ago, right, hanging chads, votes in the balance, uncounted votes in Florida. Now an Oscar winner. And this morning the ultimate international honor." Smith discussed the possibility of a Gore 2008 presidential run with John Vendehei from Politico.com. After Vendehei broke the news to Harry that "the 'inconvenient truth' for all the Al Gore for President dreamers is he doesn't really want to run and a lot of Democrats think that's a wise decision," a heart-broken Smith countered: "There are still a number of people out there. Wasn't there a full-page ad in the New York Times this week, 'Draft Al Gore?' There's still plenty of folks out here who think he's the answer..."
To celebrate Al Gore winning the Nobel Peace Prize, a jovial Matt Lauer and Meredith Vieira called up Jimmy Carter on Friday's Today show. 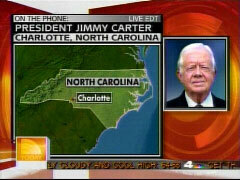 During the phone interview with the former President, the Today co-hosts even prodded Carter to push for a Gore in '08 candidacy. Matt Lauer: "Let me just go over what you said a second ago, and you also said in The Denver Post this morning. You said, 'I have confidence in and I know him well. He,' quote, 'is the best qualified person in America to be President.' And you said you would endorse him. Do you plan on giving him a call? And, and if you think he is the best qualified person in America what does that say about the other Democratic candidates who are running?" All three broadcast network evening newscasts led Friday night by celebrating Al Gore's receipt of the Nobel Peace Prize, portraying it as "sweet vindication" for him while presuming his global warming views are beyond dispute and speculating about the "tantalizing prospect" of a presidential run. ABC anchor Charles Gibson teased: "Tonight, the man who almost won the White House did win the most-coveted award on the planet. So might Al Gore go back to politics?" 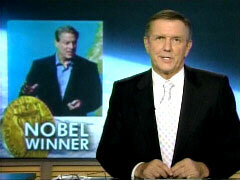 Reporter David Wright trumpeted Gore's efforts "to call the world's attention to a problem that many would have preferred to ignore," but Wright fretted that not all are aboard the Gore adulation bandwagon: "Even the Nobel Prize is not going to be enough to silence the naysayers, some of whom still believe that man is not responsible for global warming..."
CBS's Katie Couric wondered: "Will the former Vice President now go after the prize he lost, the biggest prize in American politics?" She touted him as "the first American Vice President to win this most prestigious award since Charles Dawes back in 1926." Reporter John Blackstone hailed "a remarkable comeback for a man who seven years ago seemed all but finished with public life," a comeback attributable to how Gore "traveled the world with a slide show talking about the reality of global warming." NBC anchor Brian Williams empathized with how "he never was awarded what he tried so hard to get and wanted so badly -- the American presidency -- but today former Vice President Al Gore was awarded the Nobel Peace Prize." Anne Thompson stressed the "prize has done nothing to stop the speculation about Gore's political future." She enthused that a presidential bid by Gore is "a tantalizing prospect," though "few expect" it to happen. Thompson concluded by seeing complete vindication: "Gore's co-winner of the Nobel Peace Prize, the Intergovernmental Panel on Climate Change, left no doubt that man is responsible for global warming. The debate now is over how much the climate will change if nothing is done." Whether Gore will run for President is all that animates the press corps, CBS's Blackstone relayed: "When he briefly appeared before that crowd of reporters and cameras today, Gore refused to answer any questions. Of course, the only question reporters really wanted to ask is: 'Will you run for President?'" Setting up a conversation with George Stephanopoulos about Gore's political future, ABC's Gibson echoed: "Reporters were calling out asking whether he now plans to run for President." 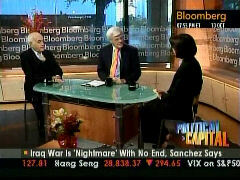 Couric followed Blackstone by bringing Bob Schieffer aboard to discuss whether Gore will run. Schieffer and Stephanopoulos doubted it. Three months after NBC promoted Al Gore's agenda by broadcasting more than 75 hours of his "Live Earth" concerts, Thursday's NBC Nightly News got the jump on the inevitable media excitement -- if Gore wins the Nobel Peace Prize to be announced Friday -- by championing how that could launch a Gore presidential bid. Anchor Brian Williams cited "rumors today surrounding" Gore about the Nobel and pronounced "that an effort to draft him to run for President just might work." Reporter David Gregory trumpeted how Gore has supposedly "become both a global force tackling climate change and a celebrated figure now in the running for the Nobel Peace Prize." Gregory highlighted the "Draft Gore" Web site and how "yesterday backers placed a full page ad in the New York Times." Bizarrely suggesting Republicans would vote for Gore, Gregory contended "Gore is seen by some as a potential savior in the '08 race with questions about frontrunner Hillary Clinton's electability and a GOP field leaving many Republicans dissatisfied." So, those who find Rudy Giuliani too liberal would prefer Gore? Gregory next featured Democratic strategist Steve McMahon praising Gore for how he "was right on just about every major issue, whether it was the war, the deficit or now global warming." CHARLES GIBSON, IN OPENING TEASER: Welcome to World News. Tonight, the man who almost won the White House did win the most-coveted award on the planet. So might Al Gore go back to politics? GIBSON: Good evening. For a man who came so close to the presidency, it may be the ultimate consolation prize. GIBSON: In Oslo, Norway, the announcement that Al Gore has won the Nobel Peace Prize, the highest recognition the world has to offer, for his efforts to spread awareness of global climate change. He shares the prize with the United Nations group dedicated to the same cause. And it immediately got people asking if this might revive Gore's political career. We're going to deal with that in a moment. But first, the prize, and we're joined by ABC's David Wright. David, good evening. DAVID WRIGHT: Good evening, Charlie. A past Nobel Laureate once said the Nobel Prize gives one the opportunity to take public stands. In a way, Al Gore has already done that, helping to call the world's attention to a problem that many would have preferred to ignore. In Palo Alto today, the former Vice President was humble and brief. AL GORE clip #1: I'm, of course, deeply honored to receive this award. GORE clip #2: This is a chance to elevate global consciousness about the challenges that we face now. WRIGHT: But the verdict from the Nobel committee must be sweet vindication. MJOS: He is probably the single individual who has done most to create greater worldwide understanding of the measures that need to be adopted. WRIGHT: Gore shares the award with the intergovernmental panel on climate change, a UN group that has advocated on global warming for two decades. For Gore, the Nobel is the culmination of an extraordinary journey. He first became interested in global warming at Harvard in the mid-1960s. As a Congressman and a Senator, he championed the issue. GORE, IN 1986: We have to begin to think about what we can do to mitigate the impact of the greenhouse effect. WRIGHT: That was long before others were ready to listen. GEORGE H.W. BUSH, IN 1992: You know why I call him ozone man? This guy is so far off in the environmental extreme, we'll be up to our neck in owls and out of work for every American. This guy's crazy! WRIGHT: Over the years, Gore has tried everything possible to call attention to climate change. GORE's VOICE IN FUTURAMA: I'm Al Gore, and these are my vice presidential action rangers. WRIGHT: Even poking fun at himself to get the message home. 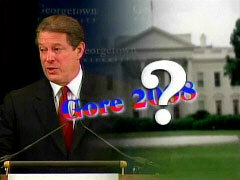 GORE, IN AN INCONVENIENT TRUTH: -I used to be the next President of the United States of America. WRIGHT: His PowerPoint presentation became a blockbuster movie. JERRY SEINFELD, ANNOUNCING AWARD, AT OSCARS: An Inconvenient Truth. WRIGHT: Winning the Oscar, and now this. Quite a consolation for the man who almost was President. President Bush has only recently come around to acknowledging the issue. Today, the President's congratulations had a grudging tone. "Obviously, it's an important recognition," a White House spokesman said. "We're sure the Vice President is thrilled." Even the Nobel Prize is not going to be enough to silence the naysayers, some of whom still believe that man is not responsible for global warming, and that the kinds of policies Gore advocates would seriously damage the economy. Now, Gore is donating his half of the $1.5 million prize money to a Palo Alto nonprofit that's dedicated to convincing people otherwise, Charlie. 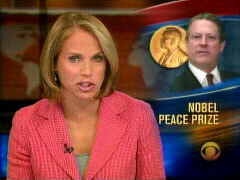 KATIE COURIC, IN OPENING TEASER: Tonight, and the Nobel Peace Prize goes to Al Gore. AL GORE: I'm, of course, deeply honored. COURIC: Will the former Vice President now go after the prize he lost, the biggest prize in American politics? COURIC: Good evening, everyone. A lot of people thought he'd win, and this time he did. Al Gore won the Nobel Peace Prize today for raising world awareness about climate change. He is, by the way, the first American Vice President to win this most prestigious award since Charles Dawes back in 1926. And it's raised speculation about whether Gore might jump into the presidential race. John Blackstone reports on Al Gore, the Nobel Laureate. AL GORE: I'll be back out in just a moment, okay? BLACKSTONE: -with well wishers and a crush of cameras. He'd been up for much of the night. It was 2:00 in the morning California time when the announcement came. BLACKSTONE: While the Nobel committee singled him out, Gore insisted today he is one of many. GORE: I will accept this award on behalf of all of those who have been working so long and so hard to try to get the message out about this planetary emergency. BLACKSTONE: Gore says he'll give the prize money to his foundation, the Alliance for Climate Protection. But the prestige is all his -- a remarkable comeback for a man who seven years ago seemed all but finished with public life. After his narrow defeat in 2000, Gore grew a beard, became a visiting professor at Columbia, started an investment fund and a cable TV channel. But all the while, he was traveling the world with a slide show talking about the reality of global warming. GORE, IN AN INCONVENIENT TRUTH: Isn't there a disagreement among scientists about whether the problem is real or not? Actually, not really. BLACKSTONE: Then, in 2005, that slide show was made into a movie: An Inconvenient Truth. Gore was again the professor, but he made a complicated and controversial issue understandable. The documentary was a commercial and critical success, winning an Academy Award. GORE, AT OSCARS: My fellow Americans, people all over the world, we need to solve the climate crisis. BLACKSTONE: The film and the Oscar started many Gore supporters dreaming about another run for President. Now, a newspaper ad is pushing to draft Gore, and the Web site DraftGore.com has a petition that so far has collected 189,000 signatures. An Associated Press poll last week showed Gore is in third place among Democrats without even being a candidate. The Nobel Prize is only adding to the pressure and speculation, speculation that the Democratic frontrunner was reluctant to comment on today. BLACKSTONE: When he briefly appeared before that crowd of reporters and cameras today, Gore refused to answer any questions. Of course, the only question reporters really wanted to ask is "Will you run for President?" And that's a question for now he seems unwilling to answer. 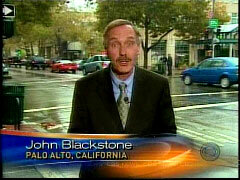 John Blackstone, CBS News, Palo Alto, California. BRIAN WILLIAMS: Good evening. He never was awarded what he tried so hard to get and wanted so badly -- the American presidency -- but today former Vice President Al Gore was awarded the Nobel Peace Prize. The prize was given out for Gore's efforts on the environment. It is his passion these days, has been for years. He made the documentary called An Inconvenient Truth and now some of Al Gore's backers see a case of convenient timing, perhaps, in today's news. 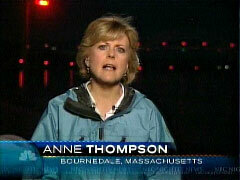 We begin here tonight with our chief environmental affairs correspondent, Anne Thompson. Anne, good evening. THOMPSON, IN BOURNEDALE, MA: Good evening, Brian. The Nobel committee hailed Al Gore as the one person who has done the most to make the world aware of what needs to be done to stop climate change, but the prize has done nothing to stop the speculation about Gore's political future. With the world watching, today Al Gore stayed on message. AL GORE: This is a chance to elevate global consciousness about the challenge that we face now. THOMPSON: His focus, global warming, pointing to this year's record melt at the North Pole as need to act, to reduce carbon dioxide emissions that fuel man-made climate change. But Gore left unanswered the question of whether this would propel him to run for the White House again. A tantalizing prospect few expect to happen. CHUCK TODD, NBC NEWS POLITICAL DIRECTOR: If Gore got into the race in the next couple months he would immediately polarize the global warming issue and create a Democratic versus Republican atmosphere, and that isn't what he wants. THOMPSON: Politics is Gore's profession, his passion is the environment. A product of the '60s, Gore was inspired by his professor at Harvard who identified the greenhouse effect of carbon dioxide. In Washington, Gore held the first congressional hearings on climate change. Republicans derided Gore as a prophet of doom when he was Bill Clinton's running mate in 1992. PRESIDENT GEORGE BUSH, OCTOBER 31, 1992: You could see tears coming down the fave of the Governor and the Ozone Man. THOMPSON: As Vice President, Gore helped negotiate the Kyoto treaty to reduce greenhouse gas emissions, but neither the Clinton nor Bush administrations signed on. He made his mark as an environmental author. GORE, IN AN INCONVENIENT TRUTH: It is the most commonly published photograph in all of history. THOMPSON: But it was in a most unlikely role, as film star of the documentary An Inconvenient Truth, that Gore earned an Oscar. MICHAEL OPPENHEIMER, PRINCETON UNIVERSITY: Al Gore has been able to put in plain language what scientists have been saying for decades. THOMPSON: And got attention environmental groups could only dream of. DAVID HAMILTON, SIERRA CLUB: I think every issue, you know, needs a communicator and needs someone to make it real for people. And I think Vice President Al Gore has provided this in a historic and transcendent way. THOMPSON: Gore's co-winner of the Nobel Peace Prize, the Intergovernmental Panel on Climate Change, left no doubt that man is responsible for global warming. The debate now is over how much the climate will change if nothing is done. Brian. Kennedy claimed: "In the scientific community, there was literally zero dissent. But at the same time, in the United States press, over 60 percent of the newspaper stories and, particularly, the television stories published, expressed some doubt about this issue. Why is that? The reason is because of a massive propaganda campaign by the Exxon corporation and by others -- but largely funded by Exxon -- that has been very, very successful at persuading the media not to cover this issue seriously and reporters simply don't go read the science." And as for the idea that there is "literally zero dissent" among scientists, that's another phony argument. Top hurricane specialist William Gray, at Colorado State University, told Discover magazine a couple of years ago that while the temperature has risen, "it is not human induced" and that "nearly all of my colleagues who have been around 40 or 50 years are skeptical as hell about this whole global-warming thing. But no one asks us." 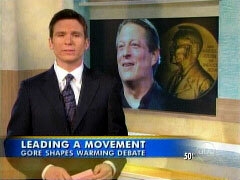 Obviously ABC News hasn't knocked on their door recently, preferring to broadcast the talking points of celebrity politicians like Gore and RFK, Jr.
Bill Weir: "We turn now to Al Gore and the Nobel Peace Prize. The former Vice President shares that honor with thousands of climatologists around the world. The latest award here evidence to many that the movement to fight man-made climate change has finally come of age and it has been a long time coming. ABC's Bill Blakemore now takes a look at the man, and his movement." Bill Blakemore: "This award has eminent scientists everywhere excited. We caught up with climatologist Robert Corell in a Massachusetts diner." Robert Corell: "When Nancy called me and screamed in the telephone the message, that Al and IPCC, I mean it was really hard for me not to pull over to the side of the road and just get out and yell, 'Yay!' Probably 10 or 15,000 scientists who have been involved in IPCC will be just joyous." Blakemore: "Joyous, because scientists have been far more worried than anyone about global warming, finding it's far more dangerous, coming much quicker, than they expected. Many scientists sharing the prize have complained that the only thing now missing was leadership. Some say there's symbolism in being linked by the Nobel to the world's most visible leader on the issue." Clip of Al Gore: "If you want to go quickly, go alone. If you want to go far, go together. We have to go far quickly." Climatologist Michael Oppenheimer: "Al Gore's absolutely unique. He's unique among political leaders having focused on this problem for almost 30 years." Blakemore: "In that time, the movement to fight global warming has evolved with Al Gore." Jerry Seinfeld at the Oscar Awards: "And the Oscar goes to â€˜An Inconvenient Truth.'" Blakemore: "From what seemed a fringe liberal cause, to a cause celebe around him." Carell: "It was a voice that was often seen as a political voice. But when you talk to him personally this is visceral. This is inside his being." Blakemore: "His persistence as much as anything has won him a devoted following, as humanity now struggles with what Al Gore calls 'An Inconvenient Truth.' For Good Morning America, Bill Blakemore, ABC News, New York." Weir: "And joining us live now from Minneapolis is another man who has made protecting the environment a lifelong cause, Robert F. Kennedy, Jr., President of the Waterkeeper Alliance. Good morning." 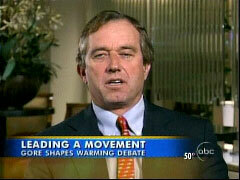 Robert F. Kennedy, Jr.: "Morning." Weir: "Your father ran for president, convinced that was the best way to tackle big problems, but forty years later it seems Al Gore is content to act as a citizen activist. Do you agree with that decision? Do you think he would do more good to the grand cause as a candidate?" Kennedy: "Well, I think that's a personal decision for him. He said he doesn't want to run so -- you know, he did win once before. [Weir laughs] But I think -- at this point, he's saying that he's not going to run. So I think we have to look for leadership someplace else." Weir: "Well, let me follow that up then-"
Kennedy: "That kind of leadership." Weir: "Yeah. Well, if he's not in, who do you like as the most qualified candidate on environmental issues?" Kennedy: "You know, I think all of the Democratic candidates have said the right thing about global warming. We've yet to see concrete plans from anybody. John McCain on the Republican side has some genuine bona fides -- although I think he's being pulled now by the gravities of the Republican primary voters to reverse some of those -- that initial good work that he's done on the issue. All the Democrats have been good on this issue. Hillary Clinton. Johnny Edwards. Obama. Bill Richardson. Chris Dodd. They've all been wonderful on this issue." Weir: "But no endorsement this morning?" Kennedy: "I think -- I'm going to be supporting Hillary Clinton in the race. I think she has the strongest record on the environment of any of the candidates and-"
Weir: "Well, let me ask you just about the fight at large. The last poll we did at ABC was in the spring, and 56% of the people still says, said, there's a debate among scientists as to whether or not climate change is manmade. Where's the tipping point? And, does the message have to change in any way to get more people on board before any grand action can be-"
Kennedy: "Well, it's not the message, it's really the media that I think is at fault here. If -- you know, the National Academy of Sciences did a study an inventory, three years ago, of all of the scientific documents that had -- the peer reviewed, refereed scientific documents that had been published in the previous decade, over 10,000 documents, 10,000 scientific studies. All of them agreed on the basics: that global warming exists; that human beings are causing it; that it's upon us now; and that its impacts are going to be catastrophic. In the scientific community, there was literally zero dissent. But at the same time, in the United States press, over 60% of the newspaper stories and, particularly, the television stories published, expressed some doubt about this issue. Why is that? The reason is because of a massive propaganda campaign by the Exxon corporation and by others -- but largely funded by Exxon -- that has been very, very successful at persuading the media not to cover this issue seriously and reporters simply don't go read the science. They say, 'Oh, well, there's somebody out there, you know, Exxon is saying-"
Weir: "Looking for the other side." Kennedy: "-Exxon's lackeys are saying this. And it's irresponsible of the media ultimately. People think -- journalists now think if they achieve balance they've done their job. But that's not the job of journalism. A true journalist, their job is to go out, to discern the truth, and then to convey the truth to the American people. And that has not happened in this case. They've simply said, well, we've done our job if we've done balance, and it's simply -- they've given a really, really, really wrong impression to the American public and they've let down American democracy." Weir: "Robert Kennedy, we appreciate your thoughts this morning. Thanks for being with us." Discover Magazine: You don't believe global warming is causing climate change? Dr. William Gray: "No. If it is, it is causing such a small part that it is negligible. I'm not disputing that there has been global warming. There was a lot of global warming in the 1930s and '40s, and then there was a slight global cooling from the middle '40s to the early '70s. And there has been warming since the middle '70s, especially in the last 10 years. But this is natural, due to ocean circulation changes and other factors. It is not human induced. Discover: That must be a controversial position among hurricane researchers. Gray: Nearly all of my colleagues who have been around 40 or 50 years are skeptical as hell about this whole global-warming thing. But no one asks us. If you don't know anything about how the atmosphere functions, you will of course say, "Look, greenhouse gases are going up, the globe is warming, they must be related." Well, just because there are two associations, changing with the same sign, doesn't mean that one is causing the other. 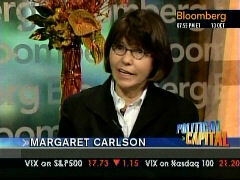 Winning the Nobel Peace Prize was a "wonderful thing" Al Gore deserved for doing "a great thing," veteran Washington journalist Margaret Carlson declared on Bloomberg Television's Political Capital show, as she contended "he rose above a great injustice" in what occurred in Florida's 2000 election count. Appearing with Bob Novak on the show, hosted by Al Hunt, which airs several times each weekend, Carlson told Novak: "You'd still be holding your breath and kicking your feet if what had happened to Al Gore in Florida had happened to you. He rose above, he rose above a great injustice. And by the way, you know, late in life you can find your gifts, which is Al Gore found what he should be doing and it is a great thing that he's done." When Novak asserted Gore merely "became a demagogue on the global warming issue," Carlson, the former Deputy Washington Bureau Chief for Time magazine who now posts columns on the Bloomberg News Web site, championed Gore's cause as she hailed how "he became a prophet on an issue that is crucially important to the world." MARGARET CARLSON: It's a wonderful thing for him and the draft Gore movement has puttered along and he hasn't responded in any way and I don't think he will do it [run for President] because he wouldn't want, you know, to take away from this huge honor. And, you know Bob, you'd still be holding your breath and kicking your feet if what had happened to Al Gore in Florida had happened to you. He rose above, he rose above a great injustice. And by the way, you know, late in life you can find your gifts, which is Al Gore found what he should be doing and it is a great thing that he's done. BOB NOVAK: The Nobel Peace Prize, I don't know what stopping people from driving the cars they want to drive has to do with peace. But the Nobel Peace Prize is a compensation for not getting elected President, is that what you're saying? NOVAK: I think that's what you said. CARLSON: What I'm saying is what Al Gore went on to do with his life was a wonderful thing. He wasn't bitter, he wasn't resentful. NOVAK: What did he do with his life? He became a demagogue on the global warming issue. CARLSON: He became a prophet on an issue that is crucially important to the world. Good Morning America anchors and reporters effusively lauded Al Gore on Friday after he won the Nobel Peace Prize for his work on global warming. Diane Sawyer opened the program by breathlessly declaring, "Former Vice President Al Gore wins the Nobel Peace Prize for helping awaken the world to global warming. Now is it time to run for president again?" In her introduction to a piece on the subject, Sawyer gushed that the ex-VP is receiving the award for "for educating the world." Reporter Kate Snow was no less laudatory: "For Al Gore, winning the Nobel Peace Prize is a personal milestone, vindication of a sort." The ABC contributor also claimed that the victory is "a new entry for the history books." To be fair, Snow did inform her viewers that the American politician beat out some very worthy individuals, such as a 97-year-old woman who saved Jewish children from the Holocaust. However, the GMA correspondent never questioned whether there was a political element to Gore receiving the Peace Prize or about the film's factual inaccuracies. She simply labeled the win not just a personal victory for the former vice president, but also "a symbolic victory for his cause." Snow also featured an unidentified individual in her piece who raved: "Giving an award for climate change means that this issue is on a par with the national security of the U.S. and every other country." It turns out, the person speaking was Michael Oppenheimer, who just happens to be a Princeton professor and a lead author on the Fourth Assessment Report by the Intergovernmental Panel on Climate Change (IPCC), the United Nations group that is sharing the award with Gore. Oppenheimer has previously smeared Republican dissent about climate change as "uninformed rambling." Wouldn't this information, or name identification at the very least, have been helpful to viewers in evaluating the man's claims? In August, NBC Nightly News similarly failed to identify his leftist connections. Finally, Friday's Good Morning America anchors and reporters made it clear what they wanted. Diane Sawyer wondered: "Now, is it time to run for president again?" 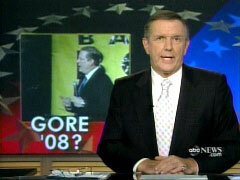 An ABC graphic asked: "Gore Wins Nobel Peace Prize: Will He Enter '08 Race?" Kate Snow closed her piece by observing, "And as for running for President, the question on everyone's mind, Gore has said countless times, over and over, that he has no intention of running for president. But you know, Diane and Robin, that this will only intensify the calls for him to get in the race." Lastly, in a tease for the 8am hour, co-host Robin Roberts queried, "Will receiving one of the world's top honors change his mind about running for President?" 7am tease, Diane Sawyer: "Breaking news this morning: Former Vice President Al Gore wins the Nobel Peace Prize for helping awaken the world to global warming. Now is it time to run for president again?" 7:01am , Sawyer: "And Good morning, America. And somebody didn't need a wake up call this morning." Robin Roberts: "You think the former vice president was listening for the phone, perhaps to ring?" Sawyer: "I think he might have been." Roberts: "Nobel Peace Prize winner that he is. And he's already said that -- He shares part of the money. It's over a million and a half dollars for winning the Nobel Peace Prize. It's with a U.N. organization that he's going to donate his portion to charity." 7:02am, Sawyer: "But first, let's turn to the big news this morning about the Nobel Peace Prize. It is exciting for former Vice President Al Gore. He is getting it, of course, for educating the world on global warming and 'Good morning America' weekend anchor Kate Snow is right here with more. Kate?" 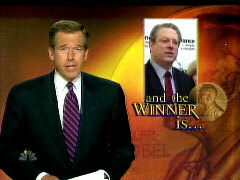 ABC Graphic: "Gore Wins Nobel Peace Prize: Will He Enter '08 Race?" Kate Snow: "Good morning, Diane. A big morning for Al Gore. Also, he's going to share this award with the Intergovernmental Panel on Climate Change. 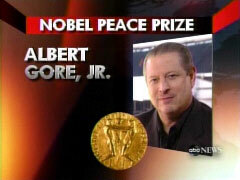 Now, Al Gore this morning has already said he is deeply honored to receive the Nobel Peace Prize. It's a pretty good year for him. He got an Oscar for his film, 'Inconvenient Truth.' He won an Emmy for his television channel and, now, some might say the biggest prize of them all, the Nobel Peace Prize." Ole Danbolt Mjoes [Not identified by any ABC graphic] (Nobel Committee chairman): "The Nobel Peace Prize for 2007 is to be shared in two equal parts between the Intergovernmental Panel on Climate Change, IPCC, and Albert Arnold Al Gore Jr."
Snow: "For Al Gore, winning the Nobel Peace Prize is a personal milestone, vindication of a sort. Seven years ago it seemed like Gore was destined to be remembered as one of history's biggest losers." Al Gore: "While I strongly disagree with the court's decision, I accept it." Snow: "But now, a new entry for the history books." Danbolt Mjoes: "The single individual who has done most to create greater worldwide understanding of the measures that need to be adopted." Gore: "Rin Tin Tin was the movie star. I just have a slide show." Snow: "Al Gore beat out 180 nominees from around the world, including Oprah, Rush Limbaugh and a 97-year-old woman who saved Jewish children from the Holocaust. But more than a personal victory, it's also a symbolic victory for his cause." Michael Oppenheimer [Not identified by any ABC graphic] (Princeton Professor): "Giving an award for climate change means that this issue is on a par with the national security of the U.S. and every other country." Snow: "Gore has practically screamed from the rooftops about the dangers of global warming." Gore: "We need to solve the climate crisis. It's not a political issue, it's a moral issue." Snow: "In an interview this summer, Gore said this is the way he wants to serve now." Gore: "I've found that there are other ways to serve. I'm focused on what I truly believe is the most dangerous crisis we've ever faced, but also the greatest set of opportunities that we've ever faced." Snow: "Now, Gore issued a statement early this morning, saying, 'I am deeply honored to receive the Nobel Peace Prize. The climate crisis is not a political issue, it is a moral and spiritual challenge to all of humanity.' He also said he plans to give the $1.5 million from the prize to the non-profit Alliance for Climate Protection. And as for running for president, the question on everyone's mind, Gore has said countless times over and over that he has no intention of running for president. But you know, Diane and Robin, that this will only intensify the calls for him to get in the race." Roberts: "Certainly will. That it will. All right, Kate, thank you very much." 8am tease, Robin Roberts: "Good Morning America continues with Al Gore winning the Nobel Peace Prize for his work on global warming. Will receiving one of the world's top honors change his mind about running for President?" On Friday's Early Show on CBS news of Al Gore's winning of the Nobel Peace Prize brought euphoria to hosts Hannah Storm and Harry Smith, as well as talk of a potential presidential run for the former Vice President. The show began with lengthy congratulatory fawning over Gore, as Smith exclaimed: "And the folks around the Al Gore household are probably running around in their socks and jumping up and down because Al Gore has won the Nobel Peace Prize." Not to be outdone, that was followed closely by Storm's assessment that "certainly, no matter what your politics, everybody likes a comeback story, and this is a comeback story. Wow. Al Gore now in the history books." In order to illustrate this "comeback," Smith proudly observed: "You know, think about this. Seven years ago, right, hanging chads, votes in the balance, uncounted votes in Florida. Now an Oscar winner. And this morning the ultimate international honor." Later in the segment, Smith discussed the possibility of a Gore 2008 presidential run with John Vendehei from Politico.com. After Vendehei broke the news to Harry that "the 'inconvenient truth' for all the Al Gore for President dreamers is he doesn't really want to run and a lot of Democrats think that's a wise decision," a heart-broken Smith countered: "There are still a number of people out there. Wasn't there a full-page ad in the New York Times this week, 'Draft Al Gore?' There's still plenty of folks out here who think he's the answer, as the one who can really beat whoever the Republican is." Many can still remember Smith's infatuation with Al Gore from his May interview when Smith tried to pin a "Gore '08" button on Gore's lapel. One would think the Early Show would not want to recount such a shameful display of a lack of journalistic objectivity, but instead they were almost gleeful in remembering the embarrassing display. Storm recalled: "And Harry, you literally tried to pin him down about this not long ago. Right?" To this, Smith explained: "Yeah, we were with him in Washington doing an interview, and, you know, people were speculating back then...And they said well maybe if he wins the Nobel, this is going to elevate him into a -- so, we actually found this pin. It's an Al Gore in '08 pin, and we tried to pin it on him." Storm also made sure to still leave the possibility of a Gore presidential run open: "You never know. It's such a wide-open race, right, what will happen?" Though Vandehei was skeptical of such a Gore '08 run, he did his best to cheer Smith up as discussed how Gore "was vindicated...And now he looks like a genius when it comes to global warming. He's had this beautiful run to win an Emmy, to win an Oscar, to write a best-seller, and now to win the Nobel Prize, so there's certainly going to be even more focus on him than ever." In response, Smith observed that "he looks like Al Gore, a man in full." 7:00am teaser, HARRY SMITH: Breaking news this morning -- in Oslo, Norway, the Nobel Peace Prize is awarded, and the winner is former Vice President Al Gore. Early this Friday morning, October 12th, 2007. SMITH: Good morning. I'm Harry Smith with Hannah Storm in New York. Julie Chen will be back on Monday. And the folks around the Al Gore household are probably running around in their socks and jumping up and down because Al Gore has won the Nobel Peace Prize. HANNAH STORM: And certainly, no matter what your politics, everybody likes a comeback story, and this is a comeback story. Wow. Al Gore now in the history books. SMITH: You know, think about this. Seven years ago, right, hanging chads, votes in the balance, uncounted votes in Florida. Now an Oscar winner. And this morning the ultimate international honor. STORM: And coming up here on The Early Show, we're going to have worldwide reaction ahead with a CBS correspondents in San Francisco, outside of Al Gore's hotel room. We are also going to be going to London with a report on the Nobel announcement, and we are also going to check in Arlington, Virginia, the question of the morning -- will Al Gore now throw his hat in the presidential ring? And Harry, you literally tried to pin him down about this not long ago. Right? 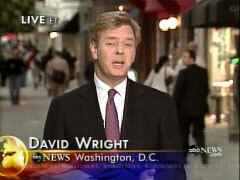 SMITH: Yeah, we were with him in Washington doing an interview, and, you know, people were speculating back then. SMITH: And they said well maybe if he wins the Nobel, this is going to elevate him into a -- so, we actually found this pin. It's an Al Gore in '08 pin, and we tried to pin it on him. STORM: He wanted no part of that. STORM: Still, I mean, all those questions are going to be asked again. Fascinating. You never know. It's such a wide-open race, right, what will happen? 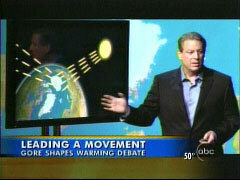 SMITH: First though, our top story this morning, roll this around on your tongue, Al Gore, Nobel Peace Prize winner. CBS News Correspondent, Richard Roth, is in London with the latest. Good morning, Richard. RICHARD ROTH: Good morning, Harry. Well, if the celebrated secrecy of the Nobel Committee's work wasn't actually broken today, then the guesswork was been pretty good. There had been strong rumors since well before dawn about who the winner would be. While former Vice President Gore shares the prestigious prize and the million and a half dollar award with the United Nations network of climate scientists called the Intergovernmental Panel on Climate Change, the Nobel Committee said Gore's individual activities stood out in what it called the struggle against climate change. OLE DANBOLT MJOES: He is probably the single individual who has done most to create great worldwide understanding of the measures that need to be adopted. ROTH: Global warming's link to global conflict, the committee said, would be in the inevitable fight over natural resources. The Peace Prize was delivered with a message. MJOES: Action is necessary now before climate change has moved beyond man's control. ROTH: And it carries controversy. AL GORE: We are facing a planetary emergency. ROTH: Gore's high-profile campaign to protect the planet, his concerts for the climate, and his academy award-winning film "An Inconvenient Truth," have drawn criticism as well as praise. Just this week a judge in Britain ruled the film needs a warning label saying it's not all fact, if it's shown in British schools. This morning Gore said he's deeply honored and pledged to donate his share of the prize to a bipartisan group, the Alliance for Climate Protection. The climate crisis, he said, isn't a political issue. Nor is the Nobel Peace Prize, it's said, but it's not just the climate that's heating up. Presidential campaign fever is rising, too, and so of Gore's odds now, at least on internet betting sites. He's repeatedly said he has no plans to enter the race, but there's no question the Nobel award will pique interest in another climate condition known as a draft. Harry? SMITH: Richard Roth in London, thank you so much. Al Gore spoke at an event in San Francisco last night in the San Francisco Bay Area. And he issued a statement about winning the Peace Prize. CBS News Correspondent, John Blackstone, has more from there this morning. Good morning, John. JOHN BLACKSTONE: Good morning, Harry. Well, it was well before dawn here this morning when the word came to Al Gore. He was staying here in San Francisco -- that he had won the Nobel Peace Prize. Now, talking about that secrecy, it's quite possible that he did have some hint that he would win this prize because he cancelled or delayed a trip to China. He stayed here last night, he spoke at a fund-raiser for Senator Barbara Boxer, and the topic of his speech there, of course, was global climate change. GORE: We have to call upon our courage as free men and women to make decisions about what is in the best interests of our civilization. BLACKSTONE: Now, we're hoping to see Al Gore here this morning. It's still very early. He has issued a statement saying he's pleased to be sharing this prize with the U.N. panel. We're waiting to see him. Haven't as yet. Harry? SMITH: Alright, John Blackstone in San Francisco this morning. And with the question of this morning, will he run? From Washington, D.C., Is Jim Vandehei, Executive Editor of politico.com. Jim, what's the answer? JIM VANDEHEI: Well Harry, I think the "inconvenient truth" for all the Al Gore for president dreamers is he doesn't really want to run and a lot of Democrats think that's a wise decision. You know, here's why -- Al Gore does not have that fire in the belly that you need to mount a national campaign. He found the 2000 campaign to be a little frustrating and too superficial. But more importantly, Democrats seem satisfied with the candidates that they have right now. They seem happy with Clinton, Obama, and Edwards as their choice. So, unless the contours of this election change fairly dramatically and fairly quickly, I do not think he'll get in. SMITH: There are still a number of people out there. Wasn't there a full-page ad in "The New York Times" this week, "Draft Al Gore?" There's still plenty of folks out here who think he's the answer, as the one who can really beat whoever the Republican is. VANDEHEI: But Harry, that's a small group of people. Most Democrats are not clamoring for a Gore candidacy right now. But let's be blunt. He was vindicated. This guy was laughed off the stage by some in the media, and some Democrats, as a policy stiff when he was vice president and when he ran in 2000. And now he looks like a genius when it comes to global warming. He's had this beautiful run to win an Emmy, to win an Oscar, to write a best-seller, and now to win the Nobel Prize, so there's certainly going to be even more focus on him than ever. But I do not think that he will run. The question I have is who does he back? There's always been tension with the Clintons, and I think he's attracted to Obama. I have no inside information, but I do think that his heart would be with Obama. VANDEHEI: I certainly think people would say that, but it still is Al Gore. I mean, he's someone who seems much more comfortable talking about the policy intricacies of global warming than he does getting on the stump and really connecting with voters. And he knows you need that. He knows he's on this beautiful publicity ride right now but that once he gets in he's going to have to face off with Hillary Clinton. That is a ruthless campaign. They know his vulnerabilities. He knows it would be an uphill road, so he's not going to get in unless he thinks he can do it. SMITH: Alright, Jim thanks so much, and I remember asking Tipper at the Oscars in March about the possibility of running for president. And when I said that, she winced. Yeah. VANDEHEI: Have a good day. Carter answered: "Well they are all well-qualified, certainly more than their, their opponents across the aisle. But I've called Al Gore and urged him to run for president so many times, he finally told me the last time, 'President Carter please do not call me-'" [Vieira and Lauer break into laughter] Vieira: "But, but, apparently I, I wonder if you're gonna listen to him, though, Mr. President." Lauer: "Maybe he it was-"
Carter: "I can, at least, do it indirectly through the news media." Lauer: "Maybe it was the fact you called him direct, former President. You gotta stop that." Vieira: "Yeah, but consider it done. We'll pass along his message, the message." Amusingly the former President, during his praise of Gore, inadvertently noted the former Vice President had won an Oscar for his "acting ability." Given the veracity of the facts in Gore's so-called documentary, An Inconvenient Truth, Carter's slip seemed rather fitting. 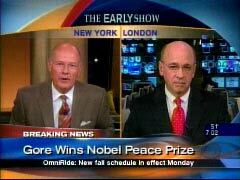 Matt Lauer: "Let's begin this half-hour, though, with the breaking news out of Oslo this morning, that Al Gore has won the Nobel Peace Prize. Former President Jimmy Carter won it, himself, back in 2002. He's out with a new book called, Beyond the White House: Waging Peace, Fighting Disease and Building Hope and he joins us now by phone. President Carter, good morning, nice to talk to you." Jimmy Carter: "It's nice to talk to you all and I'm delighted at the news." Lauer: "Yeah, yeah you're a member of this exclusive club, which has now been joined by Al Gore. So what are you thoughts on him winning the Nobel prize?" Carter: "Well I don't think anyone could possibly deserve it more. I don't, I, he's recognized nationwi-, world, in fact, worldwide, as the preeminent voice for protecting the environment at a time when many leaders are not putting this at the forefront of the world's consciousness and I'm delighted that Al Gore has won it and my own personal hope is that this might lead him to consider another political event." Meredith Vieira: "Well Mr. President there is, there's a lot of buzz about that. Do you think that having this, this Nobel prize translates into political clout?" Carter: "Well he already has political clout. There's no doubt that he won the election, by votes in 2000, and he's always been my favorite Democrat to come back. I think he's the best qualified person to be President." Vieira: "But does it help him?" Vieira: "But does it help him, to also have the prize now?" Carter: "Well, you know, that, I didn't understand your question." Vieira: "Does it help him to have the Nobel Peace Prize? Is it, is, does it add to that clout?" Carter: "Well I think so. You know he's won an Oscar for his acting ability. His forcefulness in presenting this very important issue to the American people and to the world and I think this adds another element of luster to his deserved fame." Lauer: "Let me just go over what you said a second ago, and you also said in The Denver Post this morning. You said, â€˜I have confidence in and I know him well. He,' quote,'is the best qualified person in America to be president.' And you said you would endorse him. Do you plan on giving him a call? And, and if you think he is the best qualified person in America what does that say about the other Democratic candidates who are running." Carter: "Well they are all well-qualified, certainly more than their, their opponents across the aisle. But I've called Al Gore and urged him to run for president so many times, he finally told me the last time, 'President Carter please do not call me-'"
Vieira: "But, but, apparently I, I wonder if you're gonna listen to him, though, Mr. President." Carter: "Well please do. Well I congratulate him and all those associated with him because he's brought a much needed message to the entire world and he's been a glorious champion for the environment, long before he became famous with his recent movie and all." Lauer: "Alright, former President Jimmy Carter. President Carter, nice to talk to you, thanks very much." Carter: "It's a pleasure, thank you. Bye-bye."